I’ve compiled a little list of 10 of my favourite fonts that are great to use in sports logos and graphic design. There are heaps of other fantastic fonts perfect for sport use, leave me a note in the replies of any I should check out and I might feature them in another post! The full United Collection is incredibly versatile with 105 fonts across 3 styles, 7 weights and 5 widths. It’s $US299 but this library of fonts is top of our shopping list because it covers practically everything you’ll need! Take points off however for no webfont availability (yet). Buy it here. Vitesse has a unique, bold flavour that’s perfect for sport. With 6 weights, matching italics, and with the newly released webfonts it’s useful for web and all forms of print. Buy it here. As the name would suggest, Aviano Future has a futuristic character, great for a high-tech brand. Buy it here. Jumbo gives us the option of using spurs (or no spurs) and then also gives us a layered option to create some awesome bevelled effects. Buy it here. 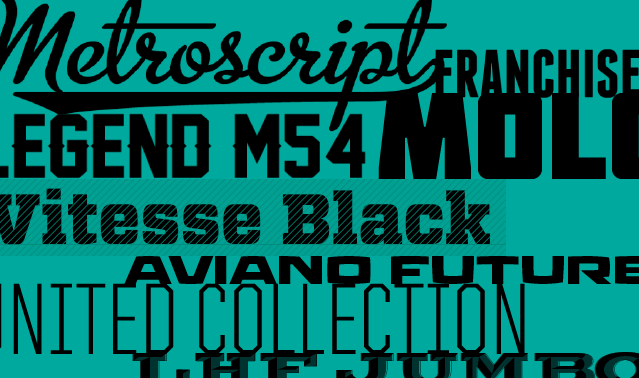 Full of retro goodness, Metroscript just looks right across the front of a uniform or cap. Buy it here. Narrow but not too narrow, condensed but not too condensed. Bebas Neue can work in a variety of situations. Download it here. Franchise is another condensed font, but with some slight quirks in some of the characters. Has a certain warmth to it that Bebas Neue doesn’t. Download it here. For when you need a stock standard sport font with spurs. Download it here. We’ve seen Molot explode across the web in the last year or so. Designers need to take care that they don’t use some of the default settings with Molot, but it can give a hefty punch when it’s used well. Download it here. You may think that Orbitron is a sci-fi only sort of font. While it does work well in that space, the designer has made sure the font doesn’t go too far with some of those sci-fi font conventions, meaning that Orbitron is actually quite useable in a lot of sporting design scenarios. Download it here. Got any font suggestions? Leave them in the comments!